As Twin Star Exorcists, Vol. 2 (Chapters 4 to 7) opens, Rokuro and Benio are forced to live together in a mansion in Narukami City. Benio must attend the same school as Rokuro, Narukami City Junior High. Now, Rokuro fears that his classmates will discover his new housemate and give him hell for it. Later, Benio enters Magano, the evil, underworld realm where Kegare dwell. She is determined to find the Kegare that killed her parents, Hyogo and Saki, six years ago. When she does, this Kegare proves to be unlike others – very powerful and seemingly unable to be destroyed. 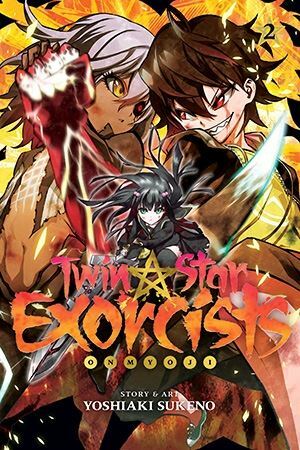 THE LOWDOWN: The Twin Star Exorcists manga is similar to other action-fantasy manga published under the “Shonen Jump” and “Shonen Jump Advanced” imprints that involve demon-fighting. It shares elements similar to series such as Blue Exorcist, Claymore, and Seraph of the End: Vampire Reign, to name a view. I was intrigued by the series after reading the first volume. Twin Star Exorcists Volume 2 narrows the focus on Rokuro and Benio as a team. It also delves into the series' larger mythology. Series creator Yoshiaki Sukeno also starts popping out more secrets and reveals, throwing a left-hook of a shocker in the final pages of this volume. That shocker did it. I'm in for the long haul. In fact, I think readers who enjoy “chosen one” magic fighters don't need me to the tell them to get Twin Star Exorcists.